Cliquez ici pour la version franÃ§aise ! 40 Pages. B5 format. 24 Folk songs, popular songs and romances, chosen by John Langran, Julia Vasilenko and Inga James. 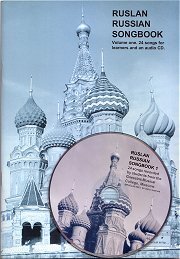 The book comes with a CD which was recorded at FM Division Studio in Moscow by students of the Gnessins State Musical College. The book contains the texts of the songs with vocabularies in order on the same page, and a full translation of each song at the back of the book for reference. Most of the musical notations are included in the book, the others are on this site. Ð�Ðµ Ð³Ð¾Ð²Ð¾Ñ€Ð¸Ñ‚Ðµ Ð¼Ð½Ðµ Ð¾ Ð½Ñ‘Ð¼! 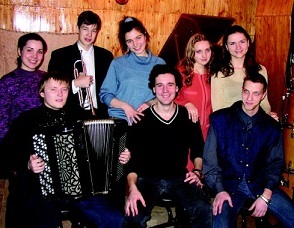 Listen to a clip from "Ð�ÐµÑƒÐ´Ð°Ñ‡Ð½Ð¾Ðµ Ñ�Ð²Ð¸Ð´Ð°Ð½ÑŒÐµ"
Listen to the chorus of "ÐšÐ°Ð¿Ð¸Ñ‚Ð°Ð½"